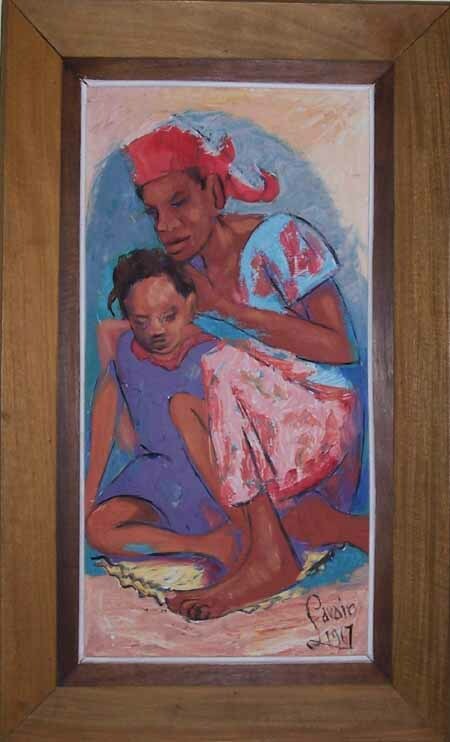 Petion Savain was born in Port-au-Prince, Haiti on February 15, 1906. He was educated at the St. Louis de Gonzague high school and the J.B. Damien vocational arts school. He began to paint in 1927 and earned a law degree at Ecole Nationale de Droit in 1931. He published his first book, la Case de Damballah, in 1939, which was also the year that he exhibited his paintings in Cuba. In 1941 he went to New York to study mural and fresco techniques with Jean Charlot, tempera with Stephane Hisch and woodcut engraving techniques with John Taylor Arms, all at the New York Art Students league. He received the IBM medal at the Treasure Island World's Fair and an award from the Gallery of Science and Art in 1939. From 1950 to 1956 Savain was a newspaper columnist in Haiti. 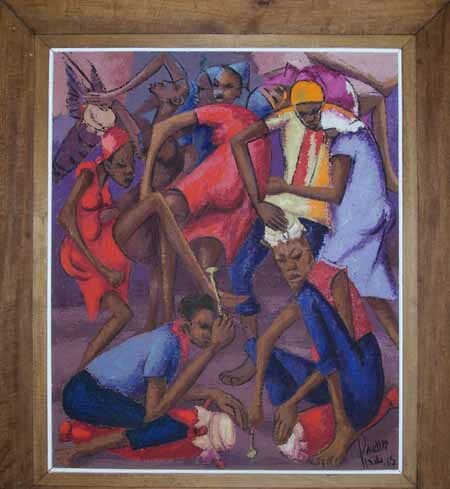 He is, of course, the quintessential market painter and has been copied by scores, if not hundreds, of Haitian artists. Petion Savain died, according to various sources, in 1973 or 1975. 1967. $2400 in original Haitian frame, mahogany. 24x20" Oil on Canvas stretched over masonite.